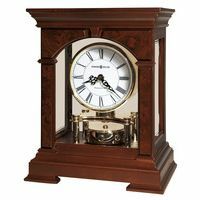 Hermle Stratford model table clock in solid hardwood and veneered bow shaped mantel clock with piano finished walnut burlwood. 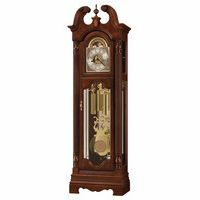 Featuring an inlaid marquetry on the front as well as inlaid brass on the columns. The glass on four sides highlights the 14-day passing bell strike movement, which has polished plates and a polished brass pendulum. 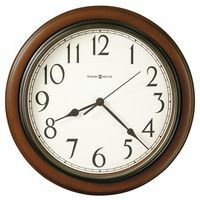 The dial ring is diamond cut and has Roman numerals with metal filigree hands.